The average chainsaw user probably uses a chainsaw occasionally only to cut wood for firewood and for general small to medium tasks around the home yard. Although there are hundreds of saw chain styles, most small consumer chainsaws models come with low profile 3/8” semi-chisel saw chains. For this reason, most typical homeowners and occasional chainsaw users may not be very particular about a chainsaw’s saw chain as would a professional or more sensitive chainsaw user. Nonetheless, below is a simple article explaining the various cutter teeth and the different chainsaw chain types. Low Profile Cutters: refer to saw chain types with round radius edge and grind profiles. They are very popular and often fitted into most consumer saw chains. They are also very simple and often easy to file. Semi Chisel Cutters: like the low profile cutters, semi- chisel cutters have a typical round radius edge as well as a round grid edge and are very easy to file. Although they cut slower than chisel chains, they often stay sharper for long even in rough sawing conditions. Semi chisel saw cutters are highly tolerant of sharpening inaccuracies, very tough and can cut for longer without getting blunt. Saw chains with semi chisel cutter teeth are ideal for cutting soft woods which tend to be fibrous rather than porous. Full Chisel Cutters: ideal for cutting hardwood trees, saw chains with chisels cutters cuts faster in all types of wood but dulls faster especially when used to cut softwoods. They have square radius edges and round grind profiles. Although they cut faster than the semi-chisel, they get dull very quickly especially in rough cutting conditions but are relatively simple to file. They require regular sharpening and generally do not tolerate sharpening inaccuracies. Square Chisel cutters: these refer to a specialty class of professional full chisel cutters. They have square radius edges and square grind profiles. Faster than any other saw chains, they get dull quickly especially in rough cutting conditions and often require frequent sharpening. They however require more filing skills and re usually file by professionals using chisel chin grinders. 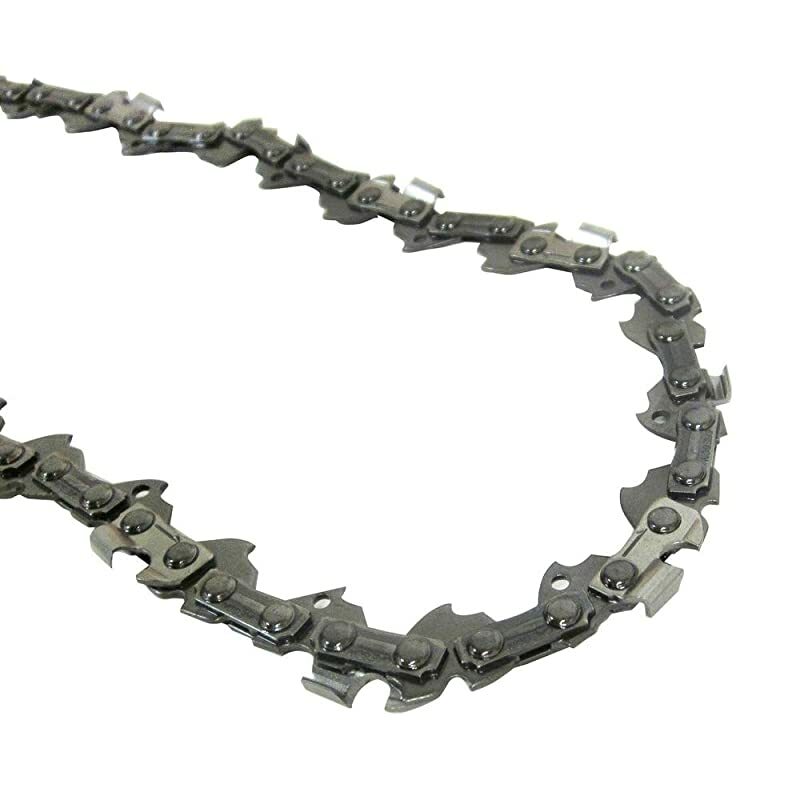 Some of the different types of chainsaw saw chains commonly used by chainsaw users. Commonly referred to as the standard chainsaw, a full house chainsaw has the most teeth and cuts through wood very smoothly. The full house saw chain is common on all guide bars that are up to 24 inches long. They are ideal for milling timber that is to be used for building because it produces smooth planks. 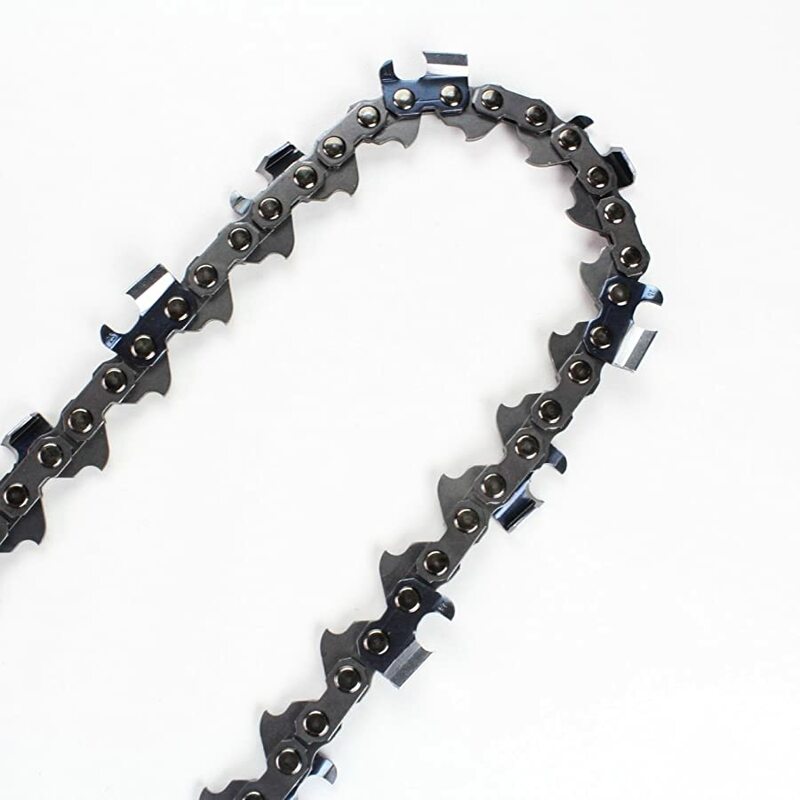 This type of saw chain has the least numbers of teeth and is perfect for chainsaws with guide bars measuring 24-Inches or more. The larger the bar guide, the better. Because of the blank links between the cutter teeth, there are only half as much cutter teeth which actually means shorter sharpening time. The cutters each take bigger bites of the wood, and quickly spin it before the subsequent cutters bite the wood and take over the cutting. 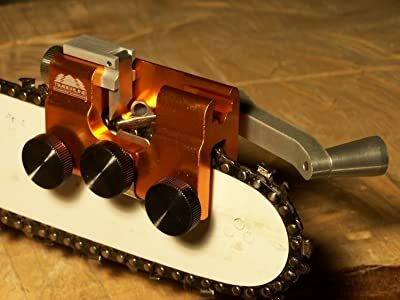 This makes this type of saw chain the best and most efficient cutting chain type especially if you will be cutting a lot of timber which does not have to be smooth. The downside of using the full skip chains is that they often rip through timber fast but will often leave rough edges and patches on the timber. They may not give you very good results if you expect smooth timber. The semi skip saw chain is somewhere between the full house and the full skip saw chain. It is a specialty saw chain that is often used by professional chainsaw users who are looking for balance between the standard and the skip saw chains and they are only fitted on square chisel cutter types. These refer to a special kind of full chisel chain types that are designed for professional use. Unlike most round ground cutter types, they are difficult to sharpen and are mostly only sharpened by professionals using special flat-headed or triangular files or bench grinders. They also cut extremely fast. This refers to a special semi-chisel saw chain with shallow angle cutters that is only used in chainsaw mills to make planks. The cutter angles (usually 10 degrees) enable the chainsaw to the cut smooth planks with good or quality appearance or surfaces.